Time, tide and vacation wait for no man, and as it happened I was traveling the past two weeks when there was big news about Santa Monica Airport. 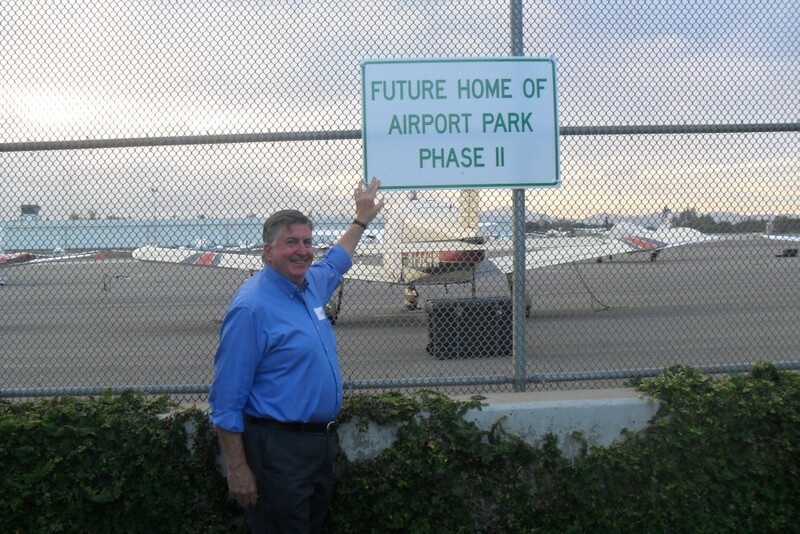 Regrettably I missed “Start the Park,” the celebratory barbecue that the Santa Monica Airport2Park Foundation threw July 1 to note the termination of the 1984 Settlement Agreement and the immediate prospects of turning twelve acres of asphalt used for airplane tie-downs into parkland. Then there was a potentially significant meeting in Washington. Under the auspices of U.S. Reps Ted Lieu and Karen Bass, representatives from the Federal Aviation Administration (FAA) heard from Santa Monica officials and from members of the public about why Santa Monica needs to control the airport land it has owned for almost a century. Because the FAA had made it clear that their representatives would not comment on anything said at the meeting there could never be concessions from the FAA that some airport-impacted residents originally hoped for or even expected, but the meeting might still lead to changes from the agency. But whatever politicians outside Santa Monica do or don’t do about the airport, the biggest issues always end up before the City Council. Tonight the council will have more tough decisions to make, in particular whether to grant three-year leases to aviation businesses. This issue was controversial in March, when the council voted to allow three-year leases on part of the airport provided that the leases included clauses that allowed the City to terminate if the City gained control of the land. The issue is even more charged now. In March opponents of the three-year leases wanted leases to be given on a month-to-month basis; now many opponents want to go further, and evict all aviation businesses from the airport. They argue that now that the 1984 Agreement has expired, the City has the right to close the airport, and further that even if the City can’t do that during the pendency of current litigation, the City can get rid of any businesses that support aviation and still not be in violation of any obligations to the FAA. It’s hard to argue with this reasoning, because the substance of the argument is correct. The City, if you look at the documents and the history, acquired, as of July 1, the right to close the airport. In fact, the City based its 2013 lawsuit against the FAA on that right. The FAA must know that it has a terrible case—in 2000 it issued a ruling that after July 1, 2015, the future of the airport would be a “local land use matter.” The agency has in recent years repudiated that decision, declaring that under a 1948 agreement the City must operate the airport in perpetuity, but there’s a reason the FAA has been trying to keep the issue out of federal court. There’s an adage in law that there’s no right without a remedy, meaning that if you can’t enforce a right, you may as well not have it, and at the moment the City has no remedy to enforce its rights. With litigation and administrative proceedings pending, the City is vulnerable. Based on recent history, it’s reasonable to fear (as the City Attorney does) that if the City made it practically impossible or even difficult to use the airport the FAA would come down on the City like a ton of bricks, those bricks taking the form of an injunction that could freeze the status quo at the airport for years and years. There may come a day (for instance, if the Ninth Circuit rules that Santa Monica doesn’t have legal standing to get a declaration of its rights in federal court) when the City’s only means of getting a judicial validation of its rights will be to close the airport, but until then the City’s best strategy is a patient one—continue the litigation in federal court to get a declaration of its rights, meanwhile do what it can to reduce the impact of airport operations. We’ve been through this before. In 2008, after years of trying to deal with the FAA about safety issues associated with large jets, the City banned them from the airport. The FAA immediately struck back and got an injunction. The City’s cause was noble, but the City lost, as the courts affirmed an FAA administrative ruling that the big jet ban violated the City’s grant assurances. In retrospect the ban was a mistake. The case cost the City a lot in money and credibility, and made the City Council and City staff gun-shy. Not only that, but it was during the course of these proceedings that the FAA repudiated its 2000 ruling that after July 1, 2015 the future of the airport would be a local land use matter. As for the business terms of the leases, I’m no expert in leasing rates or appraisals. It’s troublesome, however, that staff did not find a way to open the bidding process to non-aviation businesses for properties being used now for aviation purposes. This likely would have increased rents—under the proposed leases aviation tenants will be paying less per square foot than office tenants would pay. It does seem, however, that the City is again handcuffed because of the need, out of fear of FAA action, to keep some airport businesses operating while the litigation proceeds. It’s hard to be patient, but ultimately, I hope in just a few years, the City is going to get control over the airport land. At that point the City will convene a public process not only to design a great park there, but also to determine the future of the aviation buildings. tenants also should be offered the same favorable leases as non-aeronautical tenants. It is of no tactical value for the city to continue to play brinksmanship with the Federal govt. May be good for local political consumption (you do like to run for office) but not at all responsible to the taxpaying residents of the city. So far millions have gone to law firms litigating on the cities behalf. The city, in the future, faces millions of dollars in claims by airport operators should the operators decide to sue. Finally the city faces lose of airport property and control of airport development should the city lose the appeal. Or do you think a final appeal to the Supreme Court would be in order the city enriching law firms with another million in tax money along the way? I would think a responsible person, looking soberly at the situation, would conclude that the city’s course of action to date and the direction you advocate is at best irresponsible. Paul – thanks for writing. It’s always good to hear from the other side. I’m curious — I kind of keep track of my prognostications about the airport (I actually don’t make that many because, as I write in this article and the one I wrote the next week, after the council acted, it’s hard to predict what will happen), but I don’t recall any being proved wrong. I’ve predicted that once the City gets the FAA in court to deal with the merits of the 1948 and 1984 agreements, the City will win, but that hasn’t happened yet. The great prediction that was proved wrong, of course, was by the AOPA, which thought SM voters would want to keep the airport, and they bet almost a million dollars on that and lost big. As for money, and legal fees, I don’t know if this was a prognostication, but I’ve said that the City would make big money when it could take over the leases aviation businesses had with firms like Volkswagen, and, indeed, it looks like the City will make more money in rents this year than it’s ever spent on outside lawyers. Will the operators decide to sue? On what? Leases that expired? They said they’d sue over the landing fees, but they didn’t. The operators don’t have causes of action. The 1948 agreement is b/n the City and the federal government, not with any private businesses. Thanks for writing this, Frank, and I strongly agree with you that patience is our key to success concerning SMO. I understand the frustration many people feel which coaxes the desire to close the airport immediately but, in my humble opinion, it would be a mistake to try. The FAA’s relative silence on this issue is striking. While I understand the legal reasons for its silence to me it also has a snake in the grass effect where one false move will trigger that ton of bricks injunction you speak of. I hope council holds strong.